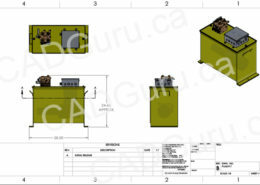 SolidWorks Sheet Metal, Weldment Safety Locker. PDF to SolidWorks Model Conversion of Railway Gearbox to facilitate Outsourcing. Fully Automated Smart Part that uses SolidWorks Global Variables. Part of Drawing Automation Workflow Processes. Took Shop Floor Hydraulic Pump Box and updated the Design to suit the new Motor. SolidWorks Sheet Metal. This Project consisted of very strict workflow protocols to ensure maximum use and ROI (Return-On-Investment) of Pre-Existing SolidWorks Part, Assembly and Drawing templates. 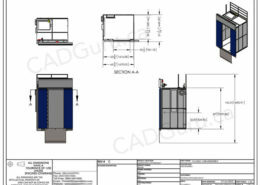 This project consisted of 109 drawings of two separate elevator designs, all of which needed a more streamlined way to update and document with EPDM and Workflow parameters. Client was investing a new design, and also had to ensure that it met Standards for ‘ABS Europe Division’ Approval in England for a ship traveling in the ocean. 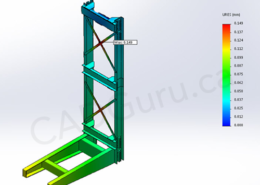 This project entailed transforming an Autocad-produced PDFs for a Hydrostor Accumulator into a SolidWorks 3D model.